Whether you’re planning an event to remember or a brief escape from the daily grind, The Castle in Ludlow Vermont is an ideal destination. With an eye towards excellence, owners Leo Xarras and Bruce Armitage have created an Inn known for quality in every way. Recognized by New England Bride Magazine and Ski Magazine as one of the top ten destinations in the country. Ask us about VT vacations or share comments. To feature your business, contact us. Come visit Ludlow in the heart of the Green Mountains of Vermont. A visit to Ludlow, just minutes from Okemo Mountain, can be a wonderful time for oh! so many reasons. The main reasons are The Castle Resort and Spa, The Pointe Hotel and The Castle & Resort Homes. This Southern Vermont getaway is the perfect place to have a business meeting, a great place to bring the family. The spa is top notch and can be a destination in itself. But, can you visualize getting married in your very own castle? What a Cinderella story. This wonderful group of lodging and dining establishments has something for all — Elegant Castle Lodging, family friendly hotel rooms perfect even for extended stay and home rentals. Let us start with The Castle Resort and Spa. This is a ten room English Cotswold mansion built in the early 1900s by Governor Allen Miller Fletcher and still boasts many of the original features. This mansion is on the list of historic hotels of America and still has the original wallpaper on the staircase, the sycamore woodwork and many of the original light fixtures including a Tiffany or two. This was a state-of-the-art project in its time and even housed an elevator. Staying here is really an historic experience. Governor Fletcher even had a separate entrance into his study, which is now a private dining room, so that his business meetings would not interfere with the family. The landscaping that surrounds The Castle is amazing. The gardens designed by Fredrick Olmsted (he also designed Central Park) has maintained the exact same footprint. These gardens house a heated outdoor pool, as well as the perfect wedding/event area depending on the size and needs of your party. The in-house event coordinator has more than ten years of experience, and this makes every detail of your event perfect. It is that simple. Weddings and events are a large party of weekends at The Castle Resort and Spa during the spring, summer and fall months. Please plan early if you are thinking about an event during the warmer months. Dining at The Castle Resort takes on elegance in itself. 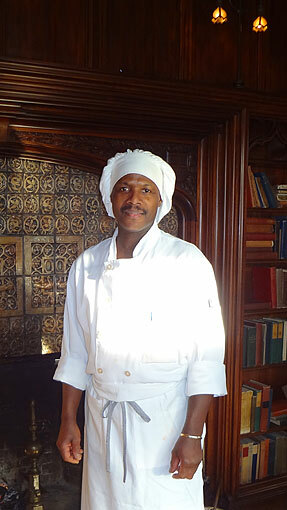 Executive Chef Alphonsus Harris prepares American-French Cuisine and has also been with The Resort for more than ten years. His abilities at creating and executing palate pleasing and eye stimulating cuisine using as many local fresh ingredients are truly artistic. I could write a complete story on the outstanding food, service and presentation of the food, however since this fine dining restaurant is open to the public (reservations suggested), I believe that first hand knowledge is the best. 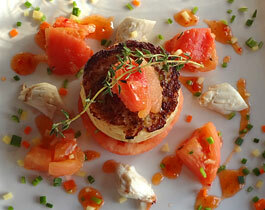 The menu is a prix-fixe, four course dinner menu that is seasonal. The portions are quite generous, so do bring your appetite. Breakfast and dinner alike will tantalize your senses.